The so-called "Match of Return" protests are underway in the Gaza Strip. 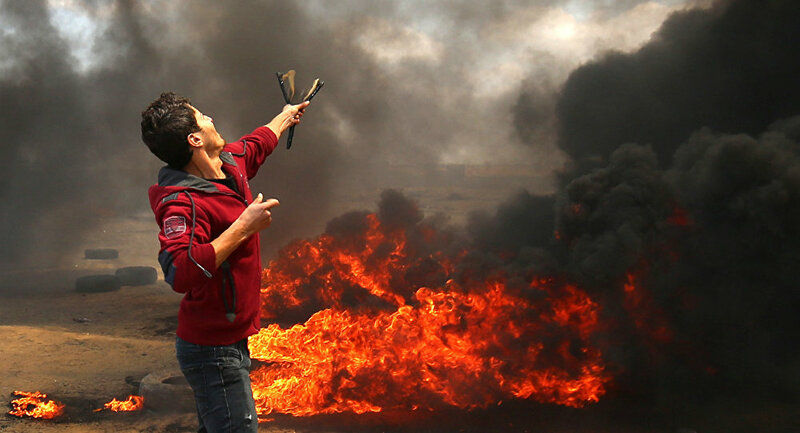 Tensions between the Israelis and the Palestinians near the Gaza border have been mounting since last March, which marked the beginning of the Great March of Return. Thousands of Palestinians have been rallying every week since then to demand access to what they consider to be their ancestral land in Israel, prompting clashes with Israeli border guards. In fall, the situation on the Gaza border escalated due to continued shelling and launches of arson balloons from Gaza into the Israeli territory. Later in the day, the Gaza Health Ministry told Sputnik that two Palestinians died and 55 were injured in clashes with Israeli troops on the border with the Gaza Strip. "Two Palestinians died, including one teenager, and 55 were injured as a result of clashes with Israeli soldiers at the eastern border of the Gaza Strip," Ashraf al-Qidra said.